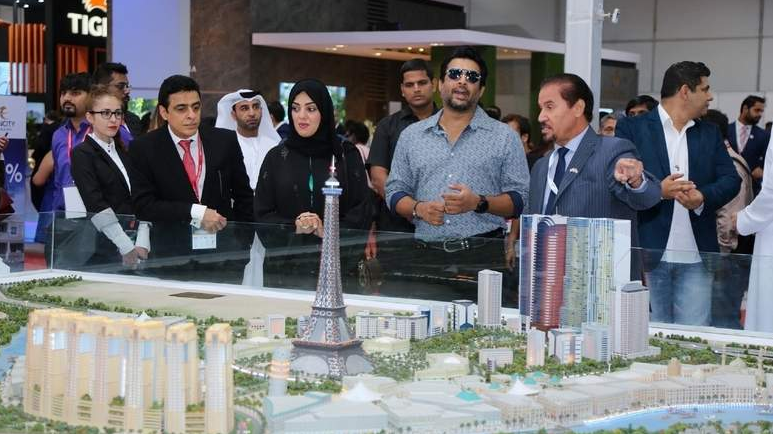 The third edition of the Dubai Property Show, the annual property exhibition of Dubai Land Department (DLD), opened to hundreds of investors at Mumbai’s Bandra Kurla Complex on Friday. It was inaugurated by Sultan Mohamed Hamdan bin Khadim, Charge d’Affaires of the Consulate-General of the UAE in Mumbai; Majida Ali Rashid, assistant director-general of the DLD; and Bollywood celebrity R. Madhavan. Major developers from Dubai, other dignitaries and guests were also present at the occasion. Spanning over three days until tomorrow, the event showcases the latest and a wide range of properties and flexible budgets from top-notch Dubai developers. Indians have by far remained the top buyers of real estate in Dubai, contributing Dh61 billion in the last three years. Ali Rashid said: “The very fact that this is our third edition of the show in Mumbai is a testimony of the Dubai Property Show’s success. Over the years, Dubai’s real estate has become a powerful tool of economic ties between India and the UAE, which we hope will continue to prosper. The Dubai Land Department is proud to be partnering with world-class developers who are showcasing their properties in Mumbai, many of whom are repeat exhibitors. We are proud of the trust that Indians have put in us as a department and the UAE as a country, and are acutely sensitive to the responsibility that we shoulder in this regard”. The event provides once-in-a-year chance for property buyers to get in-depth understanding of Dubai realty with direct interaction with all stakeholders. Through the seminars at the show, visitors can learn about the Dubai property laws, real-estate outlook, benefits for buyers, ideal locations for investment, financing options, government regulations and growth opportunities, among other topics. “Last year the show witnessed 4,094 visitors, generating enquiries worth Dh1.2 billion. We are expecting about 5,000 visitors, and hoping to see as many inquiries as last time, if not more,” said Himanshu Gupta, general manager of sales and marketing at the Dubai Property Show. “Indians are major movers within the UAE’s dynamic real-estate scene, especially here in Dubai where they are drawn to the multicultural atmosphere and diverse real-estate offerings. The Dubai Property Show is a perfect vehicle for us to meet face-to-face with India’s top investors and discuss Falcon City of Wonders’ unique ‘World in a City’ proposition, which compliments Dubai’s growth as a preferred global business, leisure and lifestyle destination,” said Salem Almoosa, chairman and general manager of Falcon City of Wonders. “The real estate market in Dubai offers sustainable growth opportunities with high returns on investments while the upcoming Expo 2020 mega event will provide property market a big boost”, said Omar Mesmar, general manager of Dubai Investment Park.